What characterizes a healthy family? This is what moms and dads seriously think about when problems or tests are encountered at home. They try to evaluate their own family and hope that there comes a time for their family to get past the tests. So, how does a family become healthy? What must a family have for them to be called healthy? But before I try to answer that question from observing many different families and my own, let me first say that when I talk about family it may refer to two kinds of relationship – the parent-child relationship and the husband-wife relationship. A good acronym to use for the characteristics of healthy families is no other than the word FAMILY. I will be using those letters to show elements of a health family. Healthy families have and make fun. It doesn’t mean that Mom needs to be a stand up comic or Dad needs to hide behind the door with a rubber nose on his face and jump out at the kids, but it means that a home should be where some fun and laughter is a natural element. Kids learn better when what they’re doing is fun. We are able to motivate people better and encourage them to participate when what we’re doing is fun. Healthy families pay attention to one another. Being interested in each other is a way of showing attention. And sometimes this is easily applied when we look at someone in the eye during a conversation whether it is between the husband and the wife or the parent and the child. Another way to apply this is by listening to each other. There are times when we should hear past each other’s words. Healthy families capture memories. Remembering is a very spiritual concept. In the Bible we’re told to “remember” 160 times. Remember these things. It says remember the things that God did. When you remember them it causes you to act in a certain way. Bring back good memories in your family. Not only does it trigger the grooves in our mind but it puts our heart and our actions in the right direction. Make up things to celebrate. Why just have a wedding anniversary? Make up anniversaries. Celebrate report cards. Celebrate decisions they make. Celebrate when you bought the home. Find reasons to celebrate. Get memorable photos enlarged. Return to memorable locations. 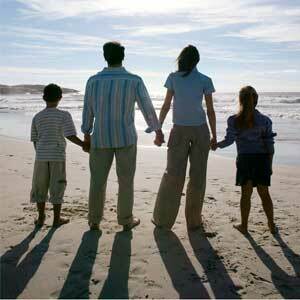 Surveys suggest that family vacations are the greatest memories that people have. If that’s true, let’s get them out there. Let’s walk by them all the time. Healthy families verbally inspire. Inspire through encouragement. To encourage means to build up. Another word for that is to strengthen, to fortify, to make strong. Sometimes at home, that’s where we are all caught off guard and we just want to do what we want to do, say what we want to say. And it sometimes is to the extent of doing the opposite of verbal encouragement. Know that people are dying for that encouragement. So we must be liberal with our praise, especially with chirdren. We may not be aware but sometimes we hold on to encouragement like it’s really expensive. It’s not expensive. It’s free. But it is valuable. Healthy families love without condition. That is the kind of love that only God can give and we can only show that kind of love in our families if we have experienced God’s love first hand. When our hearts are filled with the unconditional love of God it overflows. We can love with words. So, when was the last time you told your spouse that you love him/her? How about your child? We can also love with action. Show it. Express it. Healthy families yield to God. The parents’ job at the dinner table, in the car, when they tuck their children to bed, when they get up is to provide spiritual input. Talking about God. If you’re a parent and you want your children to be godly, you can’t just teach them about it. It starts with your life. You’ve got to live it out. If you want your children to be children of prayer and to grow up communicating with God, they’ve got to see it as important to Mom and Dad’s life. If you want kids to open up God’s word and see it as a love letter, that it’s vital to their existence, they’ve got to see it vital to your existence first. Their spiritual training starts with how parents live their life. This last letter in the acronym FAMILY is where we should all start if we want to have a healthy family. Yield your life to God first, then you yield your family to God.